I just recently checked something off my bucket list that I had honestly thought would take me a lot more time to get around to doing, namely acting as Pilot In Command for an aircraft flying around the Alps during the winter. This was an amazing experience, and something that every pilot should try to do at least once in their life, in my opinion. In my last post we talked about the legalities, now let’s talk about the planning. My goal for this flight was to fly around the Alps. I wanted the experience of flying around gigantic mountain peaks and into bucolic valleys, and preferably with the least amount of wasted time and effort to get there. I also would prefer to survive the experience, if possible. That set of criteria narrowed down the airports I would target to towered airports with published approach procedures within the Alps mountain range. That should give me another set of eyes on the ground watching the flight to ensure there was no conflicting traffic, and a published approach would give me some wiggle room to make my way down to the runway if the weather deteriorated. Given the cheap tickets of the moment were to Munich, that narrowed the set of reachable airports within my budget and a comfortable train ride to Salzburg and Innsbruck. Looking at the two, Innsbruck was my immediate choice. And yes, the reason is 100% because of the mission in Microsoft Flight Simulator. I’ve done the approach to Innsbruck in that program so many times I can almost do it without a chart, and as a result I saw the opportunity to do it in real life and went for it. This was actually the easiest part of the whole process. Now that I had a location and a proposed time frame, all I needed was an aircraft and a willing flight instructor to come with me. Thankfully the Innsbruck airport has a listing on their website of all the flight schools that operate on the field. From there it was simply a matter of emailing each of them until one agreed to perform the flight, which FlyUp did. To be fair, none of them rejected the idea, it’s just that they were the most responsive. Once I found the flight school and instructor we spent some time on the phone talking about what exactly the flight plan would look like. On their website a number of “typical” flights were posted, and the majority seemed to be going between one or two other airports in the region. The most attractive was Zell Am See, which was an airport nestled in a beautiful valley about 45 minutes away that also offered a restaurant on the field. It sounded like an ideal plan: fly over the Alps, land (and get some cross country time applied), have some lunch, and then head back. My biggest concern was the time. My wife would be joining me, and while I wouldn’t mind spending the entire day bumming around airfields in Austria she had some other plans for the day. She was very excited to go and join my flying adventure but there were limits to that excitement that I wanted to respect. So in the weeks before the trip we settled on a point to point excursion with no landing, just out and back, with a possible approach using the IFR approach into Innsbruck on return. There was one remaining wrinkle in the plan: the aircraft we had available was a Diamond DA-40, something I had never flown before. I’ve flown many different kinds of aircraft in my short 300 hours of PIC experience, from the tiny Symphony to a Boeing 737 (simulator) so I was confident that I could learn the new systems, but that just meant I needed to devote more time to study than if we had been taking a Piper Cherokee. Once the instructor and I had decided on the outline of the plan (picked dates, route, and parameters for the flight) he sent me a copy of the POH for the aircraft and some materials on the standard procedures for the airfield. I made sure to study them thoroughly before the flight, reading over each multiple times and taking notes. I knew going in that I had a two day window for this flight based on the other activities and plans that we had scheduled. Even with that window, the weather in the Alps is not always predictable and can change rapidly. To keep myself safe and out of trouble I decided to set some weather limits to take some of the decision making out of my hands and try to avoid some of the “get-there-itis” that a flight like this can create. The biggest drawback with Innsbruck is that while it is beautiful, Innsbruck is probably the most dangerous commercial airport in the world right now. 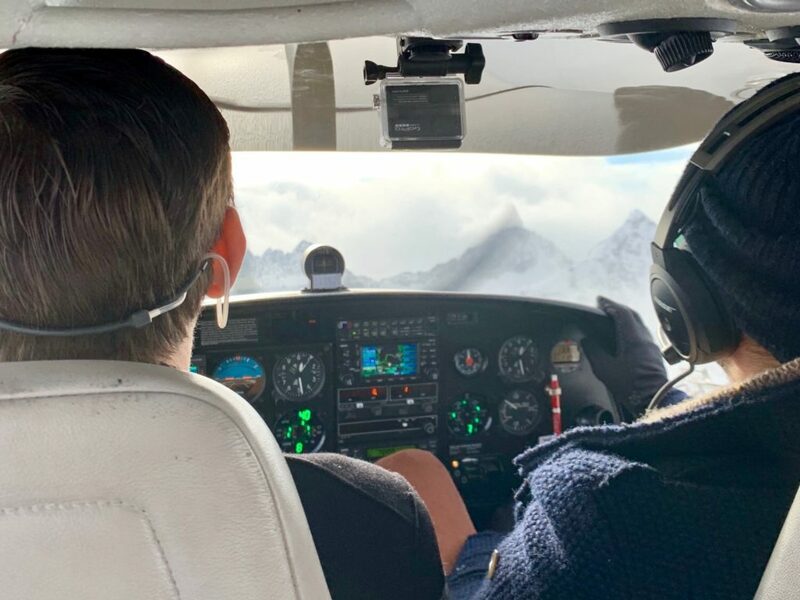 The weather, the surrounding mountains, and the complicated approach make it difficult for even the most experienced pilots. While the Innsbruck IFR approach was something I wanted to do, I didn’t want to do it in actual instrument conditions. Instrument flying is dangerous enough, no need to add the possibility of getting your heading wrong and crashing into a mountain. As such the instructor and I agreed that we would conduct the entire flight VFR, and if there was a section of the flight that wasn’t able to be conducted in those conditions we would abandon it and re-evaluate. As for a larger “go / no-go” decision, the bare minimum requirements for this flight were to be able to takeoff and land in VFR conditions and have at least 30 minutes of flying around visible mountain tops. Therefore anything more than scattered clouds around the cruising altitude and a ceiling lower than 5,000 feet would be an instant no-go decision. Everything else we left pretty negotiable. Back when I owned my own airplane I could keep the majority of my flight gear in the baggage compartment. Things like a fuel tester, spare headset, that sort of thing. But when I’m renting an aircraft I tend to bring a lot of gear with me to make sure that I can handle any situation that might happen. Sure, I could bring the whole thing with me theoretically. But not only would that be awkward to bring on an international flight and lug through airports, the majority of that gear would be redundant and unlikely to be used. Instead I decided to bring only the bare essentials that I was certain would be useful. Thankfully all of that fit nicely into my carry on, and since I usually bring my iPad with some movies on it anyway for entertainment it’s not like I was going to be carrying a lot of excess weight. With all of the prep complete there was nothing left to do but wait for the appointed day to arrive. And watch the weather. In the next article I’ll talk about how the flight went and what I learned from the experience.